When did you first play? I always played in the back garden, but I was four when I went to my local club, Old Northamptonians, with my granddad. My dad (ex-England fly-half Paul Grayson) was at the World Cup and my mum also had my newly-born twin brothers to look after, so it was a good way to get me off my mum’s hands. I played for the club from four to 17. Did you get to watch your dad play? I remember him playing the Barbarians for England vividly and playing against Jonny Wilkinson and Newcastle; I ran out with my dad as a mascot and Northampton won. Is he good for advice? We always speak about games and when we talk rugby it’s not father and son, it’s more like he’s my coach. He’s really detailed and will pick out weaknesses as well as good things. Cricket – I still try to play the odd game when I can. Rugby was always the goal for me, but I’d recommend to any young sportsman to play as many ball games as you can. It helps you develop. What positions have you played? I’ve always been a fly-half but sometimes my schoolmaster moved me to scrum-half to make me realise what went into getting me the ball. It helped my understanding. When did you first link up with Northampton? At 13. I joined the junior academy, then I got a senior academy contract two years ago. I love it here. It has been a frustrating year for the club, but I got a lot of opportunities earlier in the season and that integration into the senior squad has been really good. Are you looking forward to working with Chris Boyd? He’s worked with incredible talents. I’ll be picking his brain about Beauden Barrett and I’m excited to see what he brings. My first Premiership start at Sale. It was a horrific night – wind, rain and sleet – but the pride of wearing the No 10 shirt for Northampton Saints was huge for me. Winning the Five Nations in 2016 with the U18s was awesome too. What do you do away from rugby? I’m doing work experience with my sponsors at the club, OCM Wealth Management, and I’ll go on to do some exams with them. RW VERDICT: A key member of England’s U20 squad, Grayson has benefited from more first-team game time at Northampton. His brothers are also in Saints’ Elite Player Development Group, so we could see all three lining up in the backs in a few years. 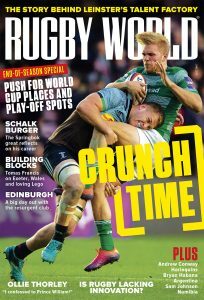 This article originally appearing in the May 2018 edition of Rugby World magazine. Follow Rugby World on Facebook, Twitter and Instagram.